Which then took until Winter 2018 to catch up a bit.. So now towards the end of March 2019, I’ve paid my subs for this year, bought some potatoes and had a not so gentle warning I’ll be served notice if I don’t start cultivating this year. 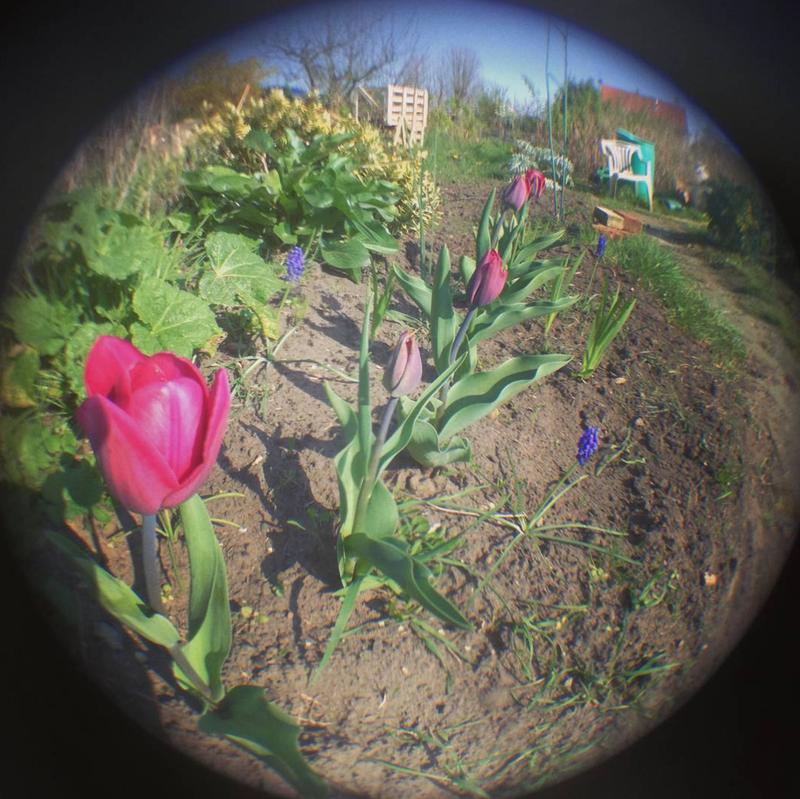 Got a new phone, and a £5 mini camera phone lens kit from Wilkos, and Tulips. Not done a lot of updates recently as there tends not be a lot worth documenting until March / April, and I’m also a bit behind again.. Weeded my pollinator border and added some woodchip as a mulch. Good to see my Hollyhock, Eryngiums, Perovskia and the other one I got from Homebase becoming established. Also bought some Potatoes from the plot shop, this is the equipment they use to measure them out. 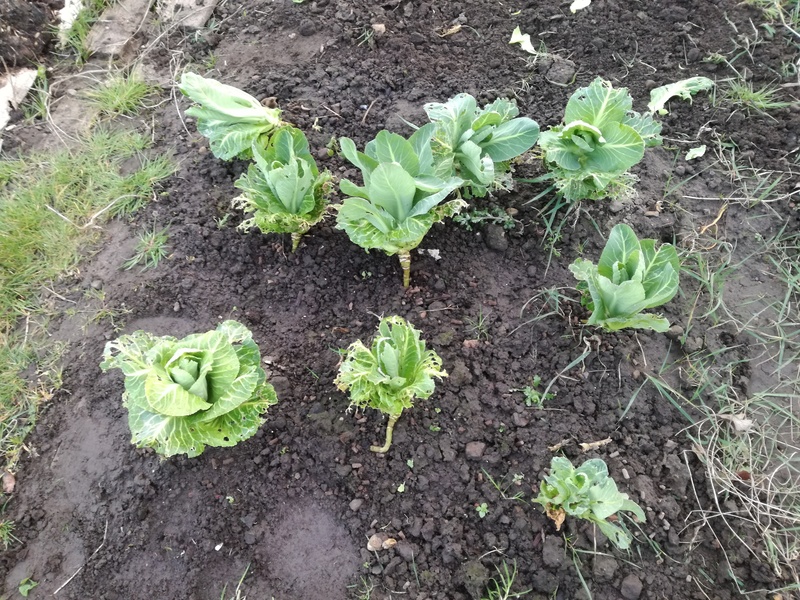 Spring Cabbages, not doing too well and full of slugs, might not bother with these in future. 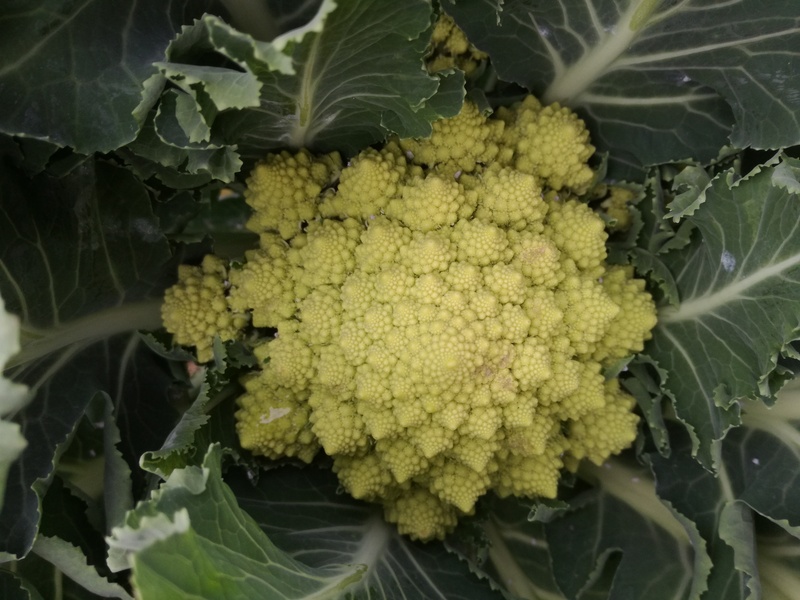 Grew an excellent couple of Romanesco Cauliflowers though! 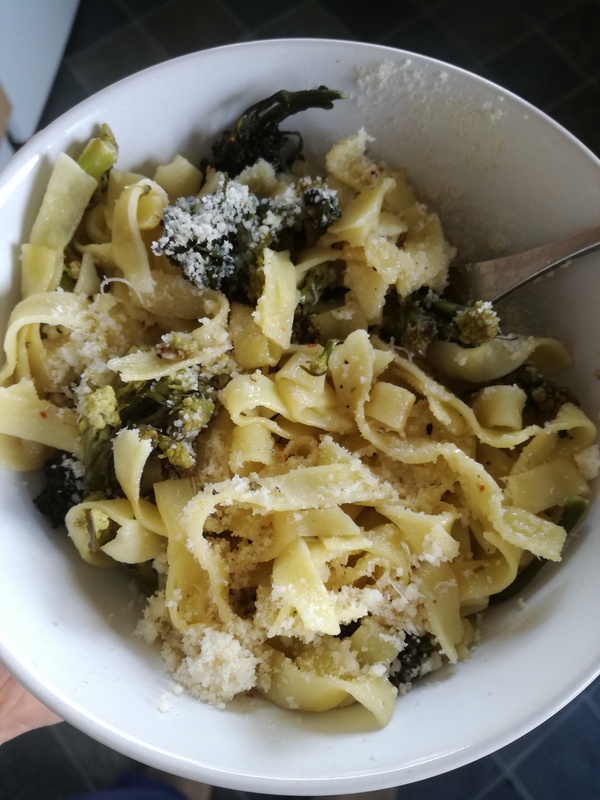 Which made a nice bowl of ‘Three Broccoli Tagliatelle’ with Purple and White Sprouting Broccoli. 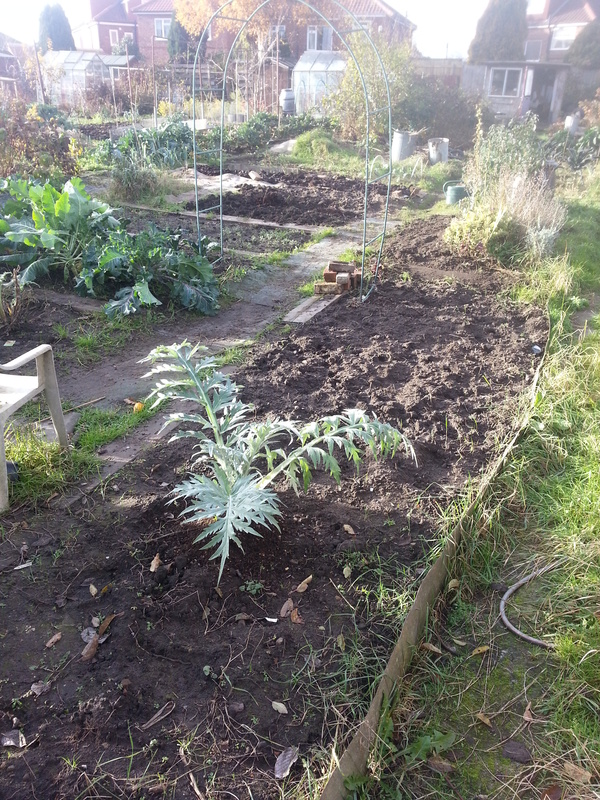 Last years Globe Artichoke establishing itself well and have prepared the bed in front to grow Brassicas. Planted this in 2015 from a packet of James Wong‘s seeds. 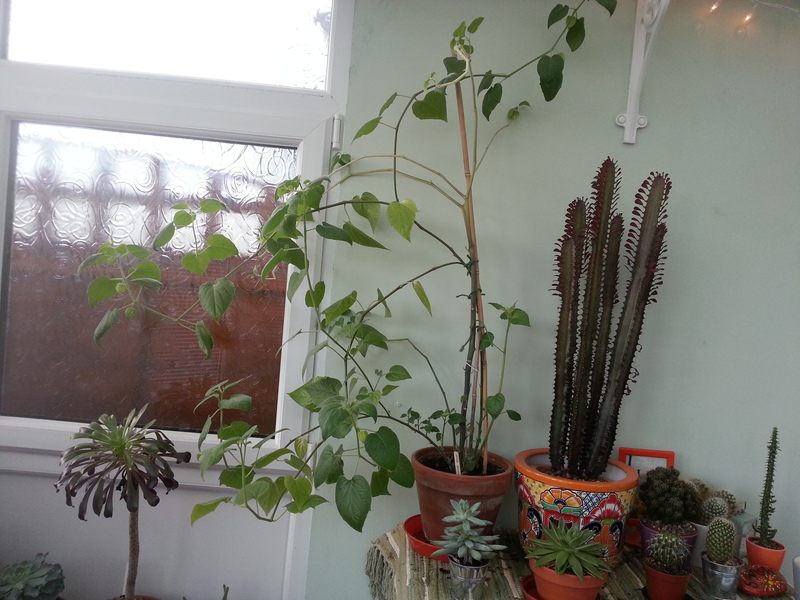 This was the healthiest plant which seems to like being in our Conservatory. Although general advice suggests it does better outside, I was concerned about how hardy it might be since we live up north with our Yorkshire frosts. I’ve staked it for some support and its starting to fruit again, but I’m sure it’s harvest was earlier last year (we maybe got about 10 – 12 berries). Wondering if I should be feeding it with anything like a tomato feed to encourage fruiting? In addition to general houseplant food which I try to give it and other plants every fortnight. A timely article by Alys Fowler in The Guardian advocating the benefits of not doing any heavy gardening/tidying in Winter for wildlife and bio-diversity. 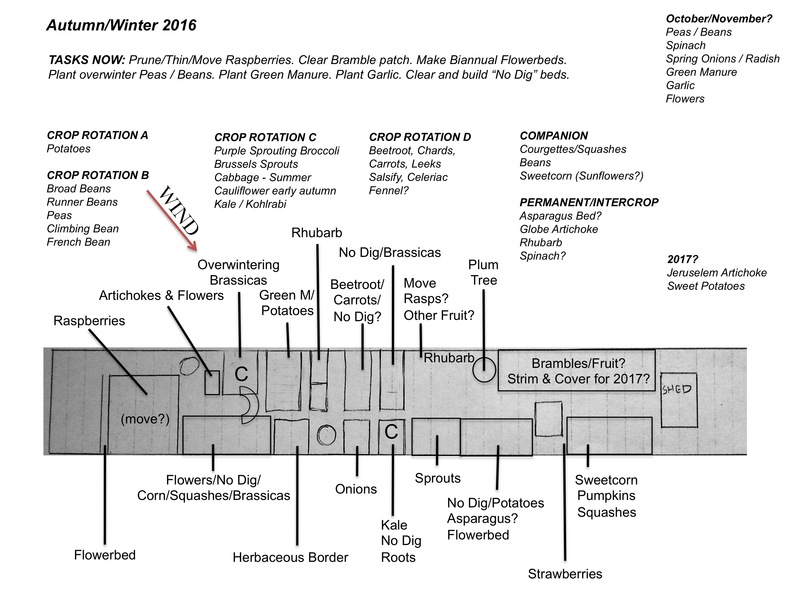 Not updated for a while as this time of year isn’t so conducive to gardening but I feel reasonably on track. Sprouts are doing well in the foreground and glad I get some in this year, hopefully they will be ready in time for Christmas Dinner! Also got some White and Purple Sprouting Broccoli coming up which should be ready for an early harvest next year (my neighbour Les’s Calabrese is starting to flower which he said has never happened in December before). Also got Spring Cabbage and Kale in. 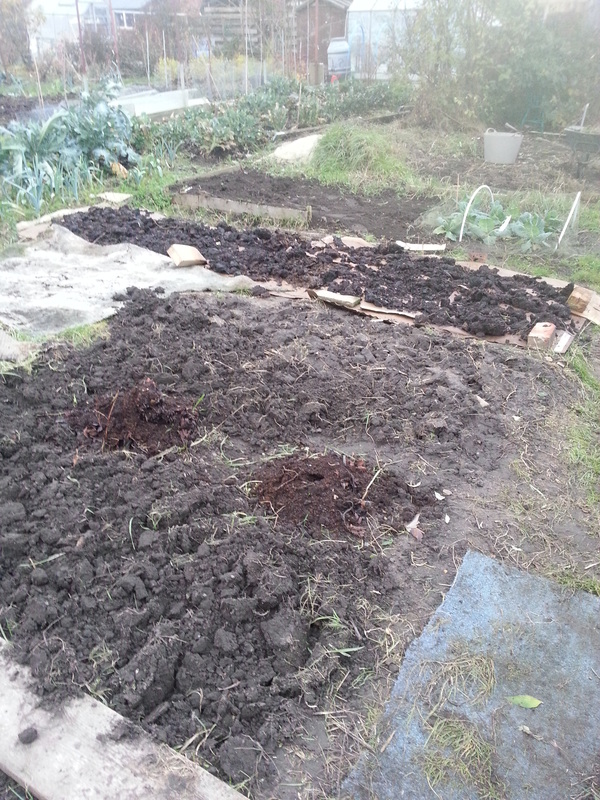 Planted some winter tares green manure in this bed to prepare for Potatoes, also mulched my Rhubarb and had a go at a No Dig bed with cardboard and manure. Also planted some bulbs for the Spring and and early Sowing of Broad Beans. Quite pleased with how this Globe Artichoke has been getting on, I’ve mulched it with some compost so hopefully it will get through the winter. Also started clearing out this bit which was covered up with carpet. If we get any nice days, this time of year can be good to get digging the earth before leaving it to freeze which helps it break down. View from the shed. 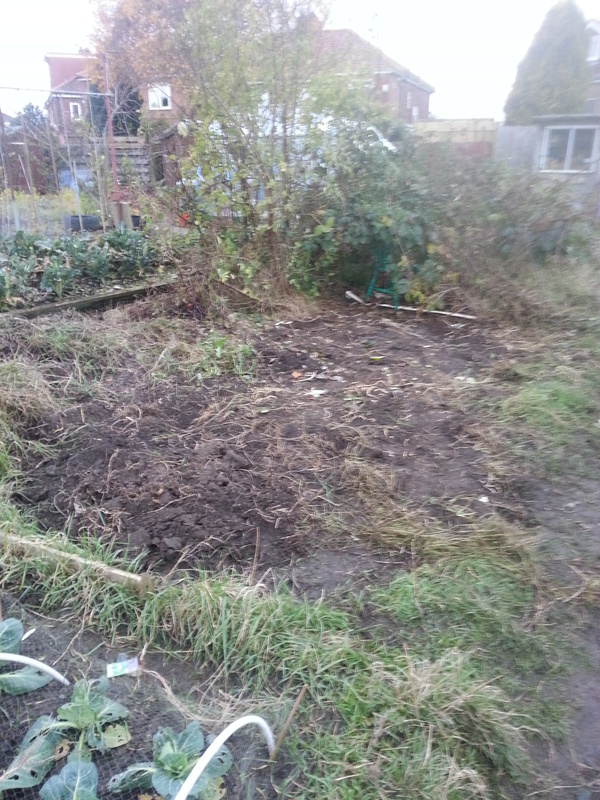 Have moved the carpet to cover where the Brambles were, so hopefully next season I should have a good 2 thirds of the plot cultivated! Updated my plan for the next few months. Again I have various options.. 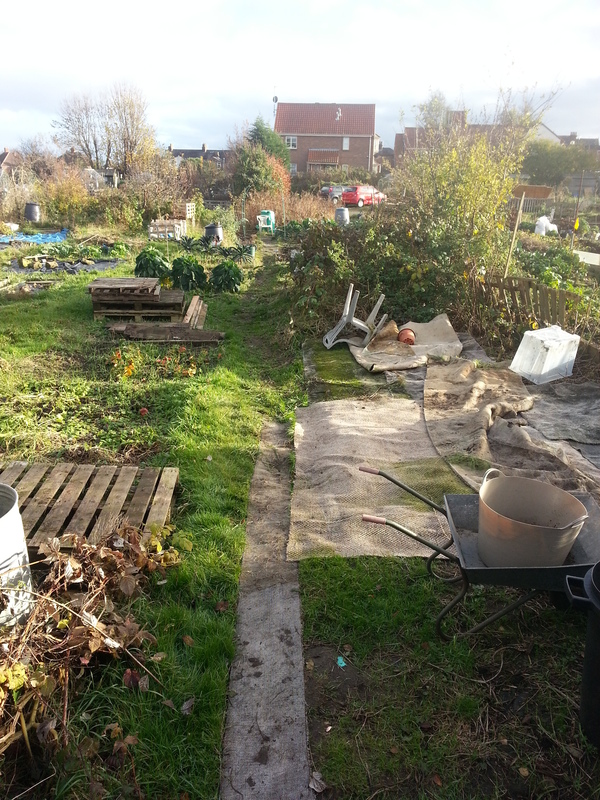 Though I think the main 2 things I want to consider are making some no dig beds and also where could be a good site for growing a cut flower bed and maybe adding fruit trees now that I know how to plant them after attending a session at St Nicks Environment Centre. St Nicks also recently presented a workshop at Greenfields School and Community Garden on No Dig gardening which was very instructive. 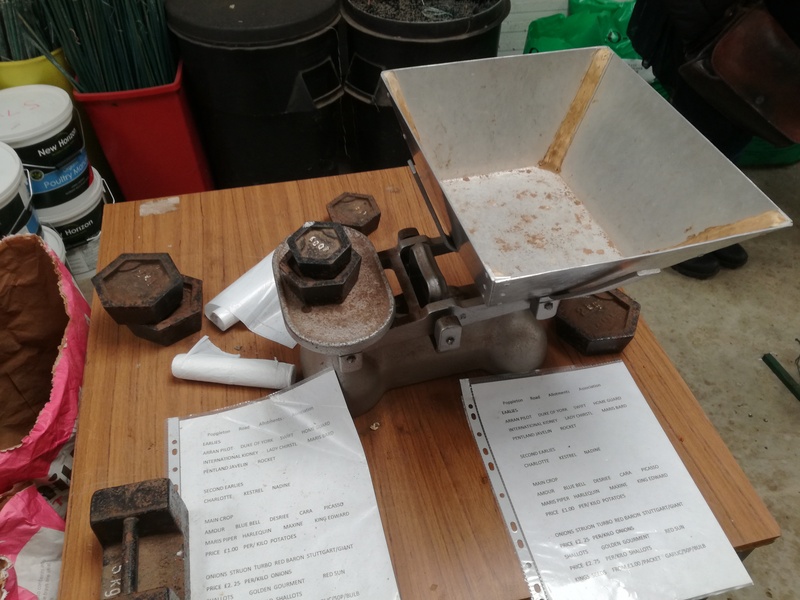 I understand the principles but I always like to see these things done in practise and I could ask questions as well, such as the best types of compost / manure and where to get it from as I potentially have large areas to cover. Of course the real pioneer of No Dig is Charles Dowding whose website has lots of helpful resources. But it’s also reassuring to know there are other gardeners in York familiar with his methods, which seem quite progressive in contrast to the way a lot of other people on our site work. Found my original contract and noticed I originally took the plot on 2 years ago today! 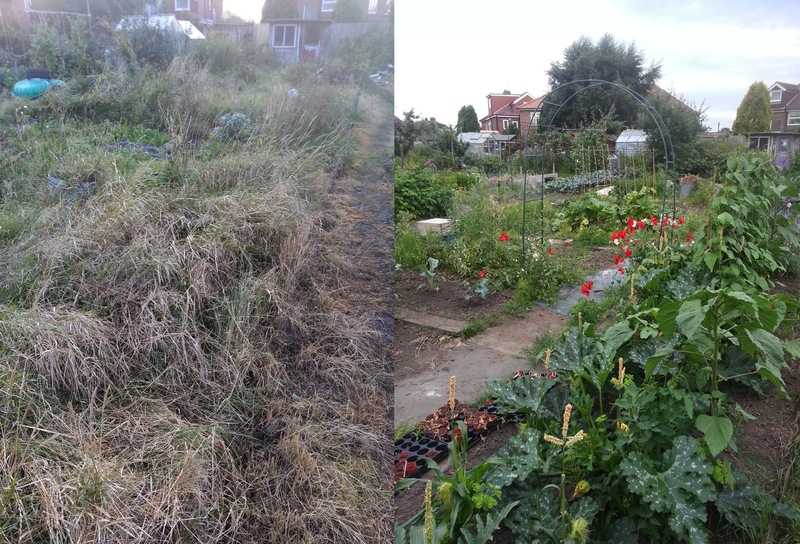 Quite pleased with what I’ve achieved within 2 years, I’ve probably got about 2 thirds of it cultivated, and working on more after clearing out the bit at the top.